The May 13 Good Morning Livingston “Adventures in Entrepreneurship” program brought together three local business owners to talk about turning ideas or economic challenges into successful business ventures. 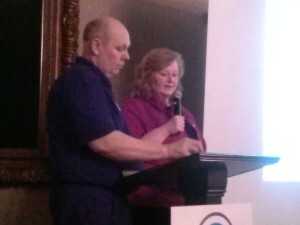 Speakers were Karen Wing of Heart of Michigan, a successful retailer in downtown Howell; Mitch Lipon of Ignite XDS, a high-tech marketing and sales firm; and David Yancho of Armor Protective Packaging, an industrial business that now has a retail line and is moving to a new location. John and Karen Wing own Heart of Michigan in downtown Howell. Wing inherited her business background from her father, who was in manufacturing. When she was in real estate, she had a building listed for sale in downtown Howell, but during the recent economic downturn, it didn’t sell. So, she bought it and renovated the upstairs apartment for she and her husband to move into. Then, she decided she wanted to open a business on the first floor. What came next was Heart of Michigan, a retail business that sells all Michigan-made products. Wing surprised the audience with mini-pasties, created just that morning by her “resident Yooper” chef. 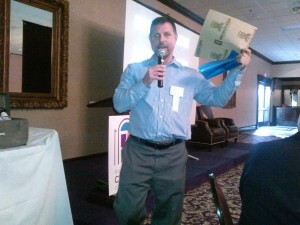 David Yoncho shows some of his business’ products. David Yoncho of Armor Packaging, a company specializing in rust-resistant packaging for parts shipping, saw sales sag during the depths of the recent recession. At the point when the economy looked its bleakest, “why not come out with a new product,” Yoncho said jokingly. The new product was a non-toxic, rust-removal bath. Armor then started a new division called Workshop Hero, a cutting-edge line of rust preventative and rust removal products designed to take the “work” out of workshop! Workshop Hero™ produces Metal Rescue™ Rust Remover Bath and Dry Coat™ Rust Preventative, clean, safe, easy-to-use products built on ARMOR’s 35-year history in providing expert corrosion management products and services to Fortune 500™ companies around the world. 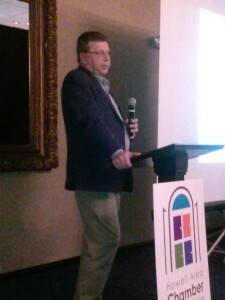 Mitch Lipon of Ignite XDS talks about how he turned his 1980s graphic design business into a high-tech marketing firm. Mitch Lipon started a graphic design business in his house in 1988; today he owns Ignite XDS, a high-tech marketing firm focused on retail and automotive, which is also expanding into other areas. Lipon has four core fundamentals: he works hard to set himself apart, he refuses to do business with people who are unethical (or who he just doesn’t like, he said jokingly), he stays on the leading edge of technology, and he is always available for his children. Ignite XDS was selected to be part of Goldman Sachs 1,000 Small Businesses program, which he enthusiastically endorsed to those in attendance. Describing it as “Reader’s Digest MBA,” he said he’s learning and doing homework like he hasn’t done since high school. The Howell chamber hopes to have Congressman Mike Rogers in for his annual legislative update program, but scheduling has been difficult. “Adventures in Entrepreneurship” was the last program of the season; subscriptions to the upcoming series are available. Call the chamber at 517.546.3920 or go to howell.org for more information.